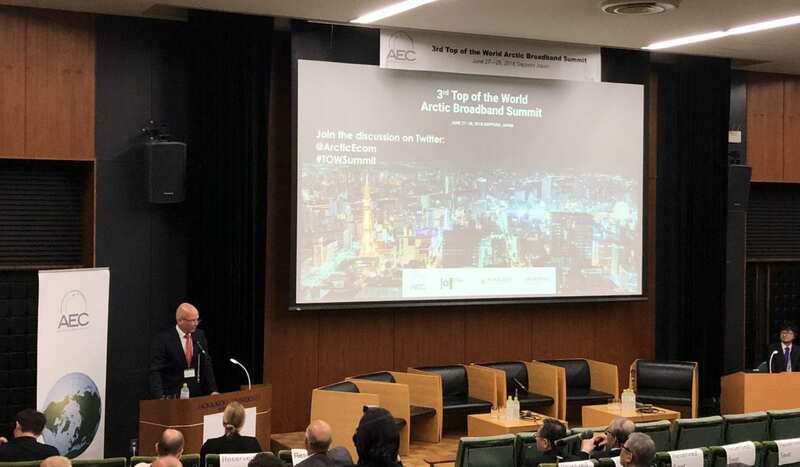 On June 27-28, 2018 the 3rd AEC Top of the World Arctic Broadband Summit took place in Sapporo, Japan. Over two days more than 20 speakers and 100 participants from 10 different countries gathered at the event. The Summit included panel sessions and discussions with experts from across the globe, networking opportunities and site visits to exciting Hokkaido-based companies working in the field of connectivity solutions and IT. The event was organized in collaboration with the Hokkaido University, Hokkaido Government and Hokkaido Committee for Economic Development. It followed the success of the inaugural Top of the World Arctic Broadband Summit in Barrow (Ukpeagvik), Alaska in 2016 and the 2017 Summit in Oulu, Finland. Read more about the events here. Moderator: Anu Fredrikson, Director, Arctic Economic Council Secretariat. Tero Vauraste, AEC Chair; President & CEO of Arctia Ltd.
Toyoharu Nawa, President, Hokkaido University. Junji Ishii, Chairman of Hokkaido Committee for Economic Development; Chairman, North Pacific Bank Ltd.
One of the factors driving the Arctic’s future is global digitalization. Without access to affordable and stable broadband, the rural parts of the Arctic will be left behind of the development brought by digitalization. But if realized, plans for improved connectivity in or through the Arctic can be a game-changer not just for the region, but also globally. The Arctic has a geographic advantage: uniting 3 continents, it provides the shortest link for data cables, the trading routes of digital economy. Aki Uljas, Business Development Director, Cinia . Find presentation here. Kristina Woolston, Vice President External Relations, Quintillion. Yoshio Sato, Senior Manager, NTT Communications. Mr. David Tossell, Director of Marine Engineering, Alcatel Submarine Networks. Find presentation here. Johannes van de Kemenade, Member, Board of Directors & Managing Director, NxtVn Netherlands. Heidar Gudjonsson, AEC Vice Chair/Chairman of Board, Vodafone Iceland. Find presentation here. Marjukka Vihavainen-Pitkänen, co-chair, Arctic Council TFICA. The growth in data traffic and data centers is phenomenal. It is estimated that in 2017, data centers alone accounted for 7% of electricity usage in the world. They are forecasted to triple in the next 3 years, making the industry by far the single biggest user of electricity. The carbon footprint which follows is growing alarmingly. Asia has limited energy resources but some of the most advanced ICT networks in the world. Can the Arctic, with its abundance of energy and cold climate, contribute to solving this issue of increased energy demand and search for less polluting means to drive the industry? The Arctic is also conveniently located between Asia, Europe and North America where over 90% of all economic activity takes place. Moderator: Heidar Gudjonsson, AEC Vice Chair/Chairman of Board, Vodafone Iceland. Jukka-Pekka Joensuu, Executive Advisor, Cinia. Hiroyuki Itoh, President, Crypton Future Media. Masanobu Fujioka, CTO, Ericsson Japan. Find presentation here. Juha Ala-Mursula, Director of Economic Development at the City of Oulu/BusinessOulu. Professor Tsuyoshi Yamamoto, University of Hokkaido. Find presentation here. Infinite Loop and Crypton Future Media. Janne Eskola, Partner, Director of Corporate Partnerships at Demola Global. Find presentation here. Senator Lisa Murkowski, Alaska (R). See vide message here. Mr. Jaap van de Beek, Chair Professor, IEEE Fellow, Luleå University of Technology. Find presentation here. The commercial shipping activities in the Arctic are increasing. With more than 60 ships-of-opportunity approaching e.g. the Canadian Arctic next summer and with more than 30 expedition cruise liners under construction, we will see an increased activity at Arctic seas. Moderator: Tero Vauraste, AEC Chair. Yoshikazu Kawagoe, Senior Managing Executive Officer, Mitsui O.S.K. Lines Ltd. Find presentation here. Genki Sagawa, Weathernews. Find presentation here. Russell Gould, Managing Director, Kelvin Hughes Ltd. Find presentation here. Minsu KIM, Head of Polar Policy Research Center, Korea Maritime Institute. Find presentation here. Kazuhiko Aoki, Executive Officer, Assistant Unit President and General Manager of New Business Promotion Division Space and Satellite Business Unit, J-SAT. Find presentation here. Professor Natsuhiko Otsuka, Hokkaido University: Future Arctic Shipping – sea route connecting Europe and Asia. Find presentation here. Harri-Mäki-Reinikka, Ambassador, Senior Advisor for Northern Policies and Secretary General for Finland´s Arctic Advisory Board, Finland. A press release from the event can be found here.